This week we celebrate a little milestone with our BOTW series. Last year little did we know just how popular our used car virtual-lot would be and looking ahead there’s still plenty of life in the ‘old girl, yet. To help celebrate I’ve searched high and low for something a little different. Whenever I get cornered about our BOTW series I always get asked whether we feature any exotic cars and the answer is usually “not yet” but this week is somewhat different. For our 20th edition I’ve picked out a Ferrari. OK, so it’s not the most desirable example when spoken of in pub conversations but if you’re on a budget and have always dreamt of getting into the prancing horse club then the Mondial should be the first port of call. Launched in 1980, it was named after the famed 500 Mondial race car from the early 50s, and yet, despite its angular looks, it was still styled by Pininfarina, unlike its predecessor which was designed by Bertone. It was conceived as a ‘useable Ferrari’ with a more than adequate 4-seat layout with average boot space yet still had a rear mounted V8 engine. Unlike the popularity of the 2-seat 308, thanks to a moustachioed private-eye, the Mondial never really had an easy time in its fifteen year life-span. Despite being labelled as a ‘poor man’s’ Ferrari’ the Mondial still survived to live another day and the fact remains that the likes of BMW’s 850 and Honda’s NSX all took inspiration from the Mondial. Even in 2009 it’s still a sought after car especially with current prices being as they are. It may be useable but it still needs plenty of TLC and deep pockets to match. Nevertheless, this will always be the starting point for Ferrari ownership. Next year will be the Mondials 30th anniversary so let’s just take a moment to look back at its achievements. It may have been the first 4-seat Ferrari but its legend still lived on in the 456 GT and current 612 Scaglietti, a name synonymous with the Italian car maker. This was where the Mondial was initially constructed (by the famous Italian coachbuilder Carrozzeria Scaglietti) before making its way to the Maranello production line. 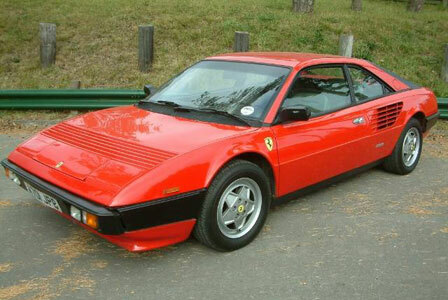 Despite the limited appeal of a four seat Ferrari even back in the 80s, the Mondial was the first Ferrari where the entire engine/gearbox/rear suspension assembly was mounted on a detachable steel sub-frame, making engine removal for a major rebuild or cylinder head removal much easier than it was on previous models. This may have been a major development but it didn’t cut repair time and costs making it one of the most expensive bills to swallow, but more of that later. Even so, owning a Mondial could save on other areas such as the yearly oil change as it was the only prancing horse where a competent owner could spend an oily Sunday morning without an expensive visit to a dealer. The more desirable 1989 3.2-litre ‘T’ will set you back over £18,000 although low mileage early cars, like our chosen BOTW, still change hands from £12,000. But don’t despair, occassionally one pops up sub £10K and despite its Ford Focus price bashing, you’ll need to be quick. You may have an all-access-area ticket into the world of Ferrari but before you consider phoning the bank first thing in the morning to apply for a loan, you need to keep an eye on the monthly bottom line. Even if you don’t use your Mondial on a daily basis, once a year you’ll still need to pop it in to see a specialist for an oil change, not forgetting the cam-belt / major service every 6000 miles. Average oil and filter plus the usual checks may set you back £200-plus but you’ll need to budget £1500 for the cam-belt change as the engine needs to come out. Other costs to tot up if you dip a toe into Mondial ownership are electric window switches failing (£150 just for one switch repair), central locking not working (£500-£700) discs and pads (£800 all round) and exhaust (£1100). Not forgetting its insurance grouping -20. An average insurance quote for a 34-year-old male living in Berkshire with 7-plus years no claims and a clean license came in at £900 for the year. Despite the high running costs the thought of owning a Ferrari is too much of a temptation for some to resist. Driving one today may work every muscle in your body with its heavy steering, clutch and gearbox, but it’s as rewarding as any with the 240bhp, 3.0-litre V8 engine rocking up all the right noises behind the rear seats. It may not be the prettiest Ferrari of all time and not lightning quickbut once you’ve had a taste behind the wheel, ten-grand seems a small price to pay for such a privilege.